A press release hit my desk today about the Road Safety Strategy – 2020, which was launched last week by the Department of the Environment (DOE). The press release issued by Jeff Stone with comments by Chris Hodder, the BMF’s (British Motorcyclists Federation) Government Relations Executive based in London, states that “Compulsory Basic Training has not yet been implemented in Northern Ireland”. However as we riders in Northern Ireland are aware, Compulsory Basic Training (CBT) was introduced in our wee province officially on Monday 21st February 2011 – i.e. just over a month ago. This seemed strange, considering that we have been reporting over the last year on the proposals for CBT and together with the BMF’s Chair of the Northern Ireland Region, Howard Anderson (with whom we have an excellent working relationship), we have had our views represented on the stakeholders group that has delivered the CBT scheme. If this were the case, we would gladly join the BMF in opposing any such ban on all unaccompanied riding by learner motorcyclists. Last year the DOE issued a consultation on proposals for implementing the 3rd EC Directive On Driving Licences in Northern Ireland, including the Summary of Consultation Responses, the Department’s Response, and Next Steps, which were all published in January this year. The DOE has specifically indicated that learner riders who ride accompanied refers to the following: “All riders wishing to ride category A2 or A motorcycles who have not yet qualified for a full licence for the larger category, will have to be accompanied by an Approved Motorcycle Instructor (AMI) when riding on the roads – whether in direct access or progressive access routes”. What this means is that a rider who has a full licence for a smaller motorcycle can ride a larger motorcycle as the rider progresses to the next category of licence. But in this circumstance and only in this circumstance, the rider must be accompanied by an Approved Motorcycle Instructor (AMI). This is advantageous for riders moving towards a test to ride a larger motorcycle. The larger motorcycle will have differing weights and handling characteristics which will ensure that a rider is better prepared to handle a larger bike. At Right To Ride we look forward to continuing our excellent relationship with the BMF in Northern Ireland as we work towards the proposed motorcycle forum and the development of a motorcycling safety strategy for Northern to deliver a relevant and non restrictive strategy for motorcycling. The British Motorcyclists Federation have today given a mixed reaction to the publication of the Northern Ireland Road Safety Strategy to 2020. While the BMF welcomes the setting up of a user forum and especially the dropping of earlier proposals for lower speed limits for motorcycles, it maintains its objection to a proposed ban on unaccompanied riding by learner motorcyclists. This is a premature proposal say the BMF given that Compulsory Basic Training has not yet been implemented in Northern Ireland. The new strategy* follows a wide ranging consultation process in which while motorcycling was recognised as a key part, it was seen more as a victim of circumstances and not as is often the case, the sole cause of casualties. In submitting its views the BMF supported the setting up of a user forum and is pleased to see that this has been included in the strategy. It has also welcomed the fact that a proposal it objected to, the introduction of differential speed limits for motorcycles, has been dropped. 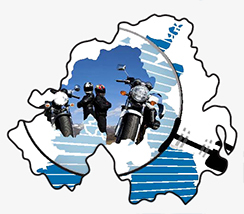 Amongst many other measures the BMF supported and are now included in the strategy, is the consideration of motorcycling in the design of new roads, installing motorcycle ‘friendly’ barriers, the development of a motorcycling safety strategy for Northern Ireland and an approved motorcycle instructor register. The BMF will now play a full part in the new forum and be pressing home its views, particularly on the learner rider aspects. We sent our concerns to the BMF and to Visordown where the BMF press release appeared. However the interpetation of the ban on unaccompanied riding is still wrong as the BMF are still suggesting that all learner riders will have to ride accompanied.